A book with Failure written boldly on the cover is terribly appealing. 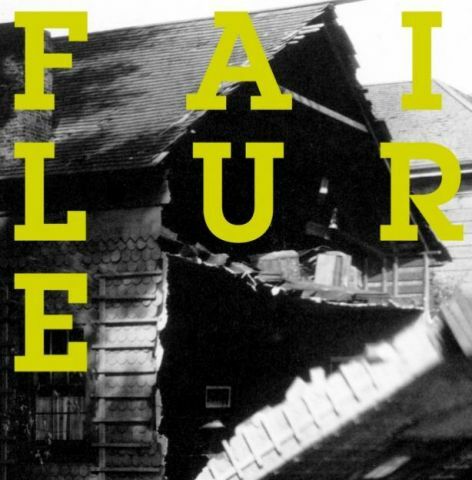 There is something tantalising about the concept and Lisa le Feuvre has finally granted failure the long overdue recognition in this impressive anthology which ‘establishes failure as a core concern in contemporary cultural production’. Finally we see how involved we are in failure, not just in the recent contemporary art which proudly strives to fail, but in art which has failed throughout history both accidentally and intentionally. From The Concept of Irony written in 1841, to Failure as a Form of Art in 2009, Failure is omnipresent and influential. In the first section of Failure, Dissatisfaction and Rejection there is an inherent understanding of artists who might be deemed ‘slackers’ (as so termed in the 80’s), who prefer not to make work or whose work appears to be the antithesis to current art systems. Art which is accepted or is in no way radical is questionable, Baldessari is quoted for saying; ‘Quite often when I thought I was brilliant, I wasn’t’’ . If instead of acceptance for our work we aim for rejection, we might come up with something of worth. Reading further into Failure, we hear John Cage say that there is, ‘No such thing as an empty space’ , and the essay by Johanna Burton which explains how something unstated or uncertain has inestimable potential. ‘Nothing’ comes up in the section titled Idealism and Doubt, as in the mystic nothing, ironic nothing, speculative nothing. These kinds of nothings in the ‘Concept of Irony’ essay explain how ‘Existence has no reality’ , and that immense freedom comes from employment of irony in art where we know appearances mean little or nothing of what they proclaim. Being actively silent is put forward by Mark Prince in reference to Roland Barthes‘ theory, where inactivity does not mean laziness but a ’failure to express’, an opportunity to not fulfill expectations. Gilles Deleuze (and a few others included in Failure) theorise around the infamous character of Bartleby, the creation of novelist Herman Melville. Bartleby delivered the eloquent phrase, ‘I would prefer not to…’[fulfill the duty / role expected of me]. He neither refuses nor accepts the task at hand, and herein Feuvre in her selections for Failure emphasises the idea of non-failure and simultaneous non-success that exists outside our usual classifications. ‘Neti neti’  meaning ‘not this not that’ carries the idea of the infinite failure in Joel Fisher‘s extraordinary essay which begins the third section, Error and Incompetence. The Greek notion of perfection once lay in the successful man, later the Christians came to see perfection in the unfinished man, or the child with potential as yet unfulfilled. Fisher outlines the evolved meaning of success and how we still might strive for it, but how we have also come to value and seriously consider our unfinished work . In this duality, you can say yes and no simultaneously, be both positive and negative, a success and a failure, say something and say nothing. Conceptualism is tackled in this category of the book by again valuing a concept which has an obvious fallibility, work by artists who exhibit ‘cracks in their objective systems’ . This is likely to be work of promise, says Jorg Heiser. Artists who have continually failed inadvertently or have acted in pursuit of failure, see success as the bad omen and the capping of potential. Failure to act or failure to complete reveals the site of full potential. The final section Experiment and Progress challenges the language we use and instead, as Feuvre states in her introduction, we should ’pull on thought rather than words’ . Our usual terms are rendered unstable and the essence and experience of art prevails over the standardised language used to conceptualise it. Some texts specifically address the field of scientific research, where the quest for an unknown answer motivates our commitment to the task. We may accept failings during the experiment but to ultimately fail, to even see that failure coming, is surely not an option. ‘Try again. Fail again. Fail better’. Here Feuvre introduces us to ‘the myth of progress’ which our language can limit to a route designed to achieve success and impossible perfection. Feuvre hopes we might come to value the experience more than the promised or desired result. Repetition is a further point of reference in Failure, where artists have practiced failed repetition, repeated failures, and their failure to recall or relive, reminding us again that we are human beings destined to make mistakes. Examples are given repeatedly in Failure, of failing protagonists like Bartleby or Sisyphus (from Greek Mythology, a man who is set an impossible task which he fails to quit thus continues to do infinitely). They are suspended in their refusal to commit to neither success nor failure, and for this they are suspended in history where their examples stand the test of time. Likewise the publication Failure has the ability to influence idea in both art and life for centuries to come, it elucidates the power of the unfinished idea. Failure has a sense of the incomplete about it in being by no means conclusive but speculative and absorbing, akin to the artists Feuvre values who are aware of their own shortcomings, in the most positive sense of the word. Jane Faram is a Sheffield based writer, artist and currently Gallery Coordinator at Site Gallery, contributing writing to Our Favourite Places, Dig Yorkshire, Corridor 8, previously Arts Editor for Article Magazine.